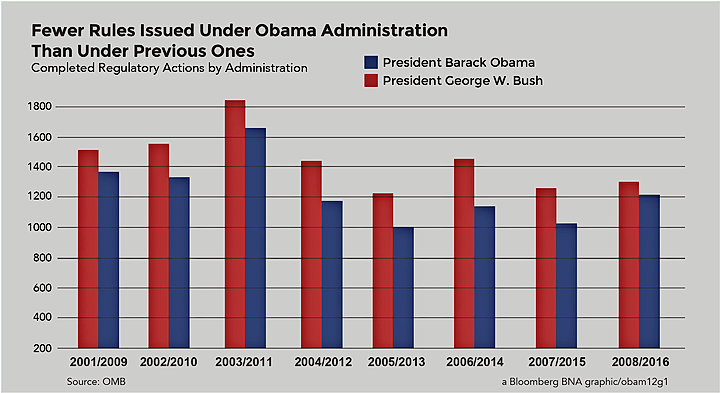 The Obama administration issued fewer regulations than previous administrations, but more rules were economically significant, even when adjusted for inflation, according to new research. Business groups have long complained about the “tsunami” of federal regulations coming from the Obama administration, though the apparently simple task of counting regulations is not at all straightforward. Of the thousands of regulations issued by agencies each year, the vast majority are for minor, routine matters. Far fewer are considered “significant” and must be reviewed by the Office of Information and Regulatory Affairs (OIRA), an agency within the White House Office of Management and Budget (OMB). Yet another subset of regulations is considered “economically significant,” defined as those with an economic impact of $100 million or more annually. Converting the OMB’s estimated benefits and costs to 2009 dollars and checking them against the higher, inflation-adjusted threshold shows that inflation does not account for any of the rules classified as economically significant, Daniel Perez, a policy analyst at the Regulatory Studies Center at George Washington University, wrote in a commentary on Jan. 11. Perez authored the new research. OIRA Administrator Howard Shelanski told Bloomberg BNA in December that, while the number of economically significant rules was up, the definition hadn’t changed since 1993. “When people compare economically significant rules, you need to keep in mind that there has been no adjustment for inflation and the factors that would lead one to raise that threshold,” Shelanski said. An exit memo from OMB Director Shaun Donovan, dated Jan. 5, said that by several measures, this administration has seen a significant decrease in the number of regulations issued. The Obama administration issued 16 percent fewer final rules than the previous administration, Donovan said. In addition, the number of significant regulations also decreased over the past eight years, compared to the previous administration, he said. In his commentary, Perez said economically significant rules are a more useful metric for drawing comparisons of regulatory output across administrations. For example, the total rules metric includes routine items published in the Federal Register such as operating times for drawbridges and details concerning fireworks displays, Perez said. The significant rules metric, although more refined, still captures a broad range of regulations, Perez said. The more useful metric is economically significant, defined in Executive Order 12,866 as rules likely to have an annual effect on the economy of $100 million or more, he said. Shelanski, in a Dec. 5 interview with Bloomberg BNA, noted that OIRA only reviews significant rules, which were down, and that economically significant rules are a subcategory of significant rules. “It is true that we have more economically significant rules, but I will make a couple of points about that. One is this: The number is not dramatically up. The second is that we have a number of rules that we simply have to do as a matter of statute,” he said. 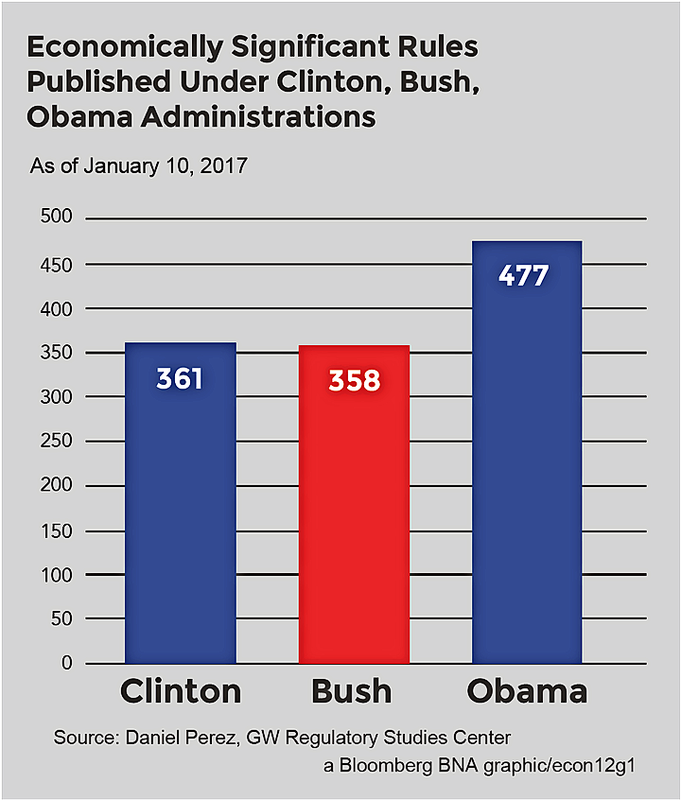 Based on Perez’s numbers as of Jan. 10, the Obama administration has issued 32 percent more economically significant rules than the Clinton administration and 33 percent more than the Bush administration. However, the threshold for economic significance is rather low and has not changed since Executive Order 12,866 was issued in 1993, Shelanski said. “I also think it’s important to note—and this is something that is often missed by some of the critics who like to talk about economically significant rules—an economically significant rule can reach that threshold because of benefits it brings to the economy, not just because of costs,” Shelanski said. A number of rules, some of them on energy efficiency, have been relatively low cost and high benefit, Shelanski said. Yet, it’s both cost and benefit that factor into the $100 million threshold, he said. “One should not assume when one sees an economically significant rule that that is because of an economically significant cost burden on the economy,” Shelanski said. The $100 million threshold actually was set much earlier than 1993, said Amit Narang, regulatory policy advocate for Public Citizen. To formalize regulatory review during his administration, President Jimmy Carter issued Executive Order 12,044 in March 1978. Under the order, Carter’s OMB required all new regulations having an economic impact of $100 million or more to be accompanied by a regulatory analysis prior to its publication in the Federal Register. “The Obama administration has no reason to be apologetic about issuing more rules that have saved lives, prevented sicknesses, held Wall Street accountable for fraud and recklessness, prohibited discrimination, and protected consumers than previous administrations,” Narang said. Narang also argued that the threshold for economically significant regulations should be tied to the size of the economy as measured by gross domestic product, because, by definition, these are regulations that are big enough to have a significant impact on the economy as a whole. In 1978, when the economic significance threshold was originally set, $100 million was equal to 0.004 percent of the economy, he said. In 2011, 0.004 percent of the economy was equal to $660 million, and therefore the economic significance threshold is in need of an update, Narang said. Further, the threshold should be adjusted at least once every year, so that it is continually indexed to be 0.004 percent of the entire economy, he said. “This makes more sense than simply indexing the original $100 million threshold to inflation,” Narang said. The U.S. economy has grown at a much quicker rate than inflation, and the inflation rate itself would simply maintain the economic significance threshold as an arbitrary figure, he said.